Please join us tomorrow at 5 pm for our end of the year social (see below). We are also responding to some concerns members have had regarding two issues. ►Please join us for FSU's End-of-Year Party, tomorrow Thursday, May 10th, from 5-10 pm at the at Savin Bar and Kitchen. The FSU will be providing free and tasty appetizers so members can come together in fellowship, and to celebrate all the work of this past year. The Savin Bar and Kitchen is located at 112 Savin Hill Avenue, Dorchester, directly across the street from the Savin Hill Red Line MBTA stop, and walkable from campus. 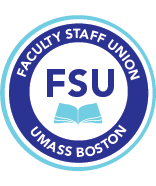 We are aware that departments are being asked to assemble new information (for many departments) for faculty who are up for promotion. This information includes teaching evaluation averages in the department and for the classes taught by the faculty member who is going up for promotion. Some departments are upset by this; some are not. Know that the contract says that departments have the right to decide how to evaluate teaching (see Article 33.4 of the contract). So if this is not information that you utilize in your own tenure reviews, and thus you don’t have this information since this is not consistent with tenure reviews you perform, and you don’t want to be tainted by seeing this information, you can certainly argue that you do not want to assemble this information because you do not want to be influenced by this information. Of course, there are other reasons for departments not wishing to follow these procedures as well (such as research on gender and racial bias), but we wanted to inform you of what the contract says about this issue. Many departments are told that faculty cannot work beyond 33 and 1/3 of their compensation. This is not true. The BOT policy concerning additional compensation in excess of 33% of a full-time faculty member’s salary, referred to as the ‘33% rule’, is here in II, F). The most essential facts are that (a) all work for additional compensation on campus must be pre-approved (before the work may be undertaken) by the department chair and dean; in exceptional cases where faculty seek to additional compensation that exceeds 33% of their annual base salary, those requests must be pre-approved by the chair, dean, and provost. The latter two are tasked with completing a review to ensure that the faculty member is performing his/her full-time obligations satisfactorily. Their pre-approval indicates their belief that the faculty member will continue to be able to do so after the additional responsibilities are added. The Provost, in concurrence with the Chancellor, needs to pre-approve the continuation of additional compensation in excess of 33% of their salary. This policy does not forbid additional compensation exceeding 33% of a full-time faculty member’s salary. It simply requires that the pre-approval and assessment procedure above be applied in cases where a full-time faculty member’s additional compensation is proposed to exceed 33% of their annual salary. We encourage you to contact the FSU if you have any questions on this.